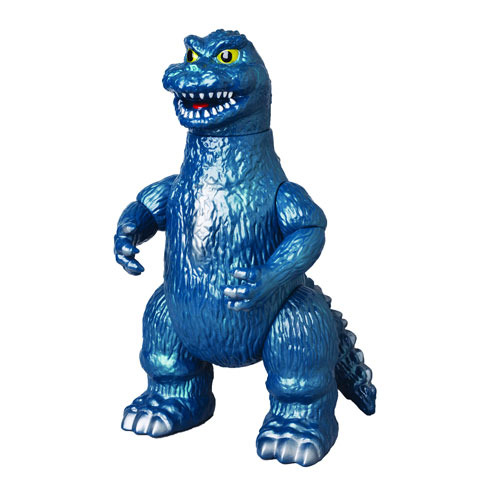 This Godzilla Vinyl Wars Pretty Godzilla Sofubi is hand-crafted, hand-painted and inspired the designer toy movement, and will hold a place of high honor in your collection! Long sought after by collectors, Sofubi Life's 2006 giant release remains a cult hit. This re-issue features Godzilla in a green on green deco, This Godzilla Vinyl Wars Pretty Godzilla figure is a limited edition of only 200 pieces! Godzilla: Vinyl Wars is a collaboration between Japan's classic sofubi manufacturers and cutting-edge toy maker Medicom Toy. Each release in Godzilla Vinyl Wars is a reproduction of a classic Toho sofubi from the 1960s through today, released legitimately for Western collectors for the first time ever. Figure measures approximately 14-inches tall. Ages 15 and up.